Engineers traced the cause of March's dramatic last-second abort of an Ariane 5 launch to an actuator in the vehicle's Vulcain main engine, a small part since replaced to allow the rocket to blast off as soon as Friday with communications satellites for the Middle East and Africa, according to Arianespace officials. The 16-story rocket and its two commercial payloads appeared ready to soar into space March 30, but the flight was automatically aborted when computers noticed something was amiss with the Ariane's hydrogen-fueled main engine. The Ariane 5 rocket's on-board computer detected an "incorrect displacement" of one of the Vulcain 2 engine actuators less than a half-second before the launcher was supposed to lift off from the launch pad, according to an anomaly summary provided to Spaceflight Now. In a typical Ariane 5 countdown, the Vulcain 2 engine ignites about seven seconds before computers give the command to fire the launcher's two solid rocket boosters, powerful strap-on motors that produce the energy for the vehicle to rise away from the pad at the Guiana Space Center in French Guiana. During those seconds, the Ariane 5 is put through an automated health check before committing the rocket to flight. The flight computer detected the anomaly March 30 about 6.6 seconds into the Vulcain engine's burn, just a fraction of a second before the solid rocket boosters would have ignited, according to Arianespace, the commercial operator of the Ariane 5. It was the first time an Ariane 5 rocket experienced such a last-second fault after its engine was already firing. Well-practiced procedures allowed the launch team to immediately put the rocket, payloads and ground facilities into a safe configuration. The rocket was drained of cryogenic liquid hydrogen and liquid oxygen propellants before it was rolled back to the spaceport's final assembly building April 1 for inspections and repairs. Engineers decided not to replace the Ariane 5's main engine, but workers removed multiple actuators from the Vulcain 2 and shipped them to their manufacturer in Europe for analysis, according to Mario de Lepine, an Arianespace spokesperson. The actuators are small components that move the engine. Technicians inserted fresh units in their place. "The launch vehicle is now back to its normal sequence of operations leading to the next launch attempt," de Lepine said. Arianespace set up a task force with the European Space Agency, industry and CNES, the French space agency, to investigate the problem and oversee the rocket's return-to-flight operations. 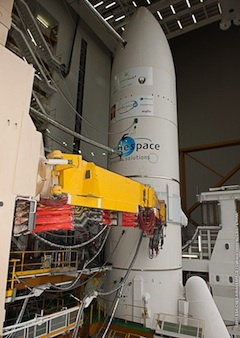 The Ariane 5 is scheduled to return to the space center's ELA-3 launch zone Thursday morning. Liftoff is set for Friday at 2137 GMT (5:37 p.m. EDT). The European rocket will haul the Yahsat 1A and Intelsat New Dawn communications satellites into orbit. The 6,600-pound Intelsat New Dawn spacecraft will link Africa, Western Europe, the Middle East and Pakistan through Ku-band and C-band transponders and antennas. Mostly financed by South African investors, Intelsat New Dawn is geared for wireless broadband, television and other media applications.